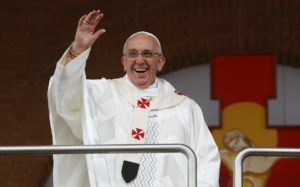 Leader of the Catholic Church Pope Francis is planning to visit the United Arab emirates in February next year and is expected to preach inter-faith dialogue, the Vatican said in a statement on Thursday. The religious leader, according to his office, will make the trip February 3-5 at the invitation of Abu Dhabi Crown Prince Sheikh Mohammed bin Zayed al-Nahyan and the small Catholic community living in the Arab country. After the UAE trip, the Pope is expected in Morocco for a visit at the invitation of King Mohammed VI. Pope Francis will deliver in the UAE an inter-faith dialogue message around the theme: ‘Make Me a Channel of Your Peace’, the Vatican spokesman, Greg Burke said. “That’s the Pope’s intention in going to the United Arab Emirates. How all people of goodwill can work for peace will be a major topic on this trip,” Burke added. “This visit, like the one to Egypt (2017), shows the fundamental importance the Holy Father gives to inter-religious dialogue. Pope Francis visiting the Arab world is a perfect example of the culture of encounter,” Burke said. The trips to the UAE and Morocco extend the list of countries with a majority of Muslims that Francis has already visited since his election in 2013. Outside Egypt, the Pope was in Turkey, Jordan, Bangladesh and Azerbaijan. The Emirati Crown visited the pontiff at the Vatican in September 2016. Written by: KanelkaTagba on December 7, 2018. Posted by KanelkaTagba on Dec 7 2018. Filed under Headlines, World News. You can follow any responses to this entry through the RSS 2.0. Both comments and pings are currently closed.